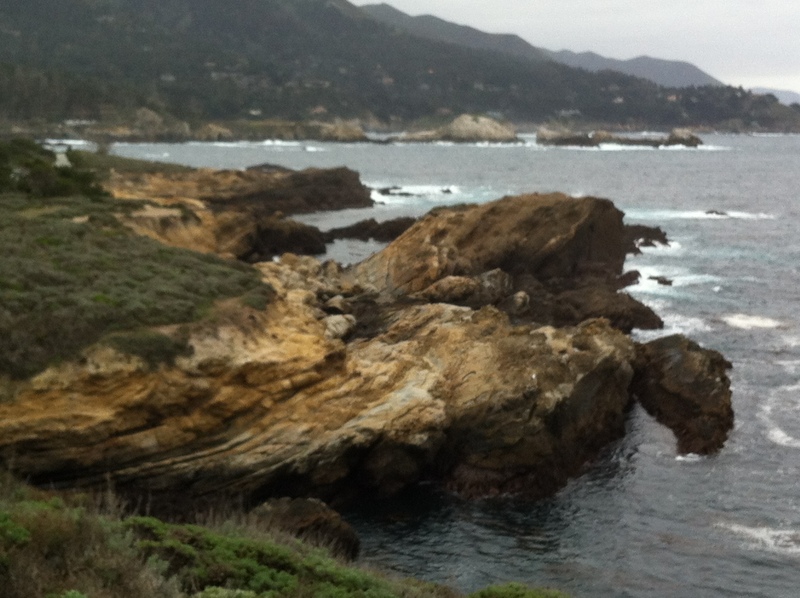 We left Monterey on Sunday as the weather turned, cloudy and dark. Unfortunately we got a parking ticket because we were late refilling the parking meter. 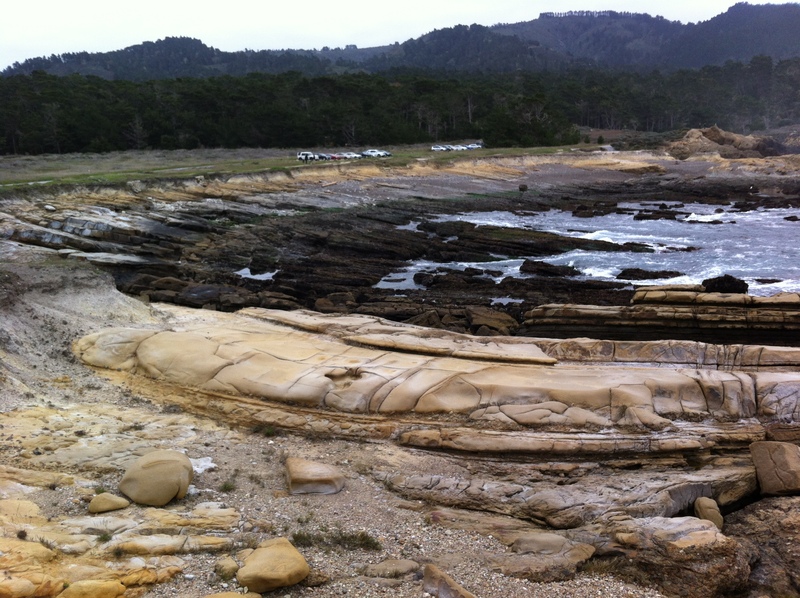 Driving past Carmel we stopped at Point Lobos State Reserve. Although the skies were cloudy, the state reserve was quite busy and once we saw the view we realized why it was popular. The state reserve stretches along a rocky coast, with beautiful ocean views. The path winds along the sandstone rocks, rising here and there and offering views over the caves, hidden beaches and wildlife. We saw cormorants (a black slender bird the size of reigers), pelicans flew by us, soaring right next to the cliffs we were standing on and in the water we could see seals hanging like surfers. It was somewhat cold so after we walked along the ocean for a hour or so we returned to the car and hit the road. Nancy drove us back to Carmel where we stopped at the CVS and Starbucks. There was a homeless man (maybe an old veteran) sitting at a bench outside CVS. I saw another man give him dogfood for his very cute terrier. On the way out I gave him a vitamin water and chocolate chip cookies and complimented him on his pets – he also had a green parrot on his shoulder – and he was very grateful. We then drove via Salinas to the 101 South where we passed a Rabobank, of all places, Salinas seemed very odd to me being Steinbeck country. And as Boom Chicago says “who would take their money to a ‘Rob-a-bank’” – there really seems no other way to pronounce Rabobank in English. 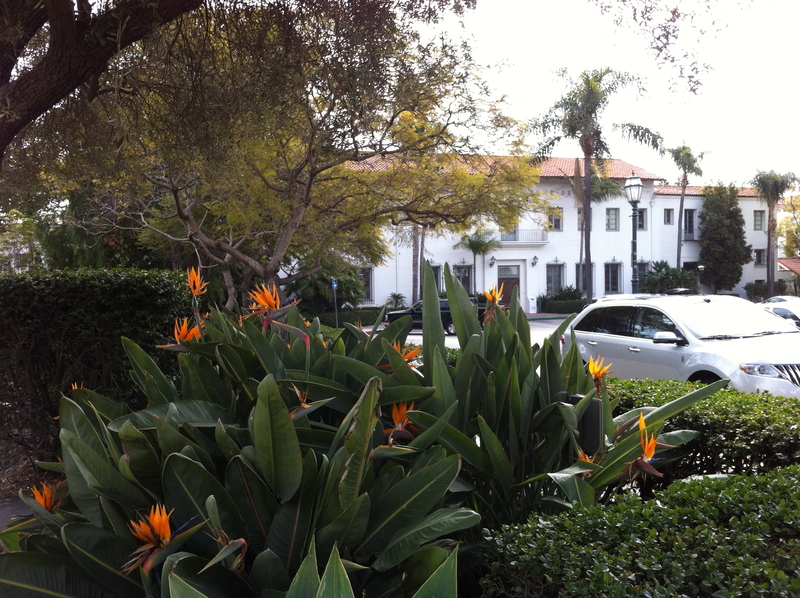 We saw three huge Rabobank offices just on the drive to Santa Barbara. It was a four hour drive to Santa Barbara but thanks to my wonderful sense of misdirection (sending Nancy north when we should have gone south on State Street and ending up in Goleta instead of Santa Barbara, and then taking the downtown exit when we should have waited), we saw all of Santa Barbara by night, which is not very much but my mishaps took us nearly an hour longer. All I can say for myself is that Google Maps spoiled me, and since I have no data outside of the free wifi at the Coffee Bean and Tea Leaf and Apple Store I’m basically a lost case when it comes to navigating. Of course, once we got to Cabrillo Street – which sounds a lot like Carillo which we thought we needed – we expected to see the Santa Barbara Inn. 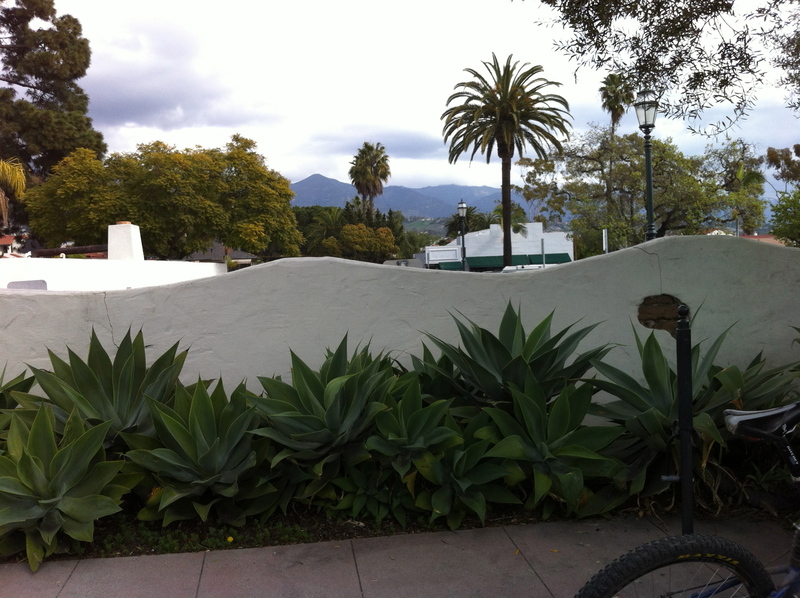 Well, Santa Barbara is quite dark at night and it was hard to find. 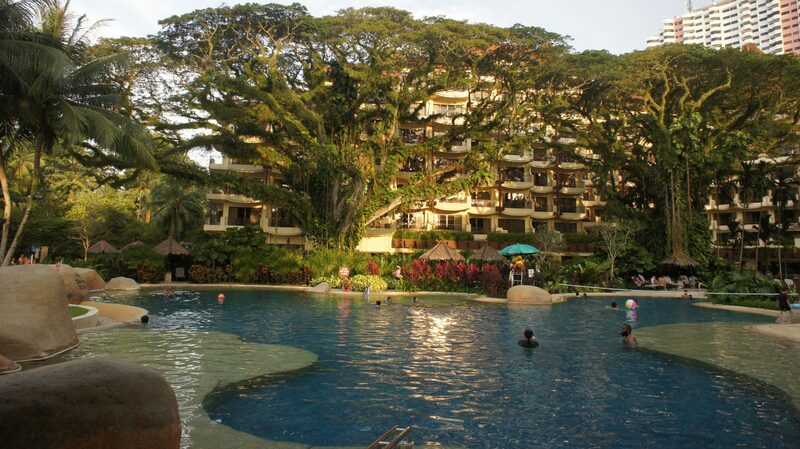 Turns out we were about 100 meters away when Nancy called the front desk and the receptionist had us turn around. 5 minutes later Nancy turned back and we finally arrived, exhausted and cranky (me, that is, Nancy is a weather-beaten traveler who is not easily phased). We checked out the bistro at the Hilton next door but it was too fancy for my taste and so we took the car and headed downtown. Downtown Santa Barbara was pretty dead on Monday night, which happened to be President’s Day. Some bars and restaurants were open but all were pretty quiet. On the street we passed a homeless woman in a wheelchair who asked for help. Of course, I said, as I gave her three dollars. We then had soft tacos at the Chipotles and Nancy fetched bottled water from the car. I really feel bad eating out when there are people just outside who don’t have food or a home to go to. Then the lady wheeled inside the Chipotles to use the bathroom – and they were very kind to her, helping her out and straightening her clothes for her. Since we don’t eat much, we had one veggie taco and one bottle of water left over which I gave her outside. It was much appreciated. 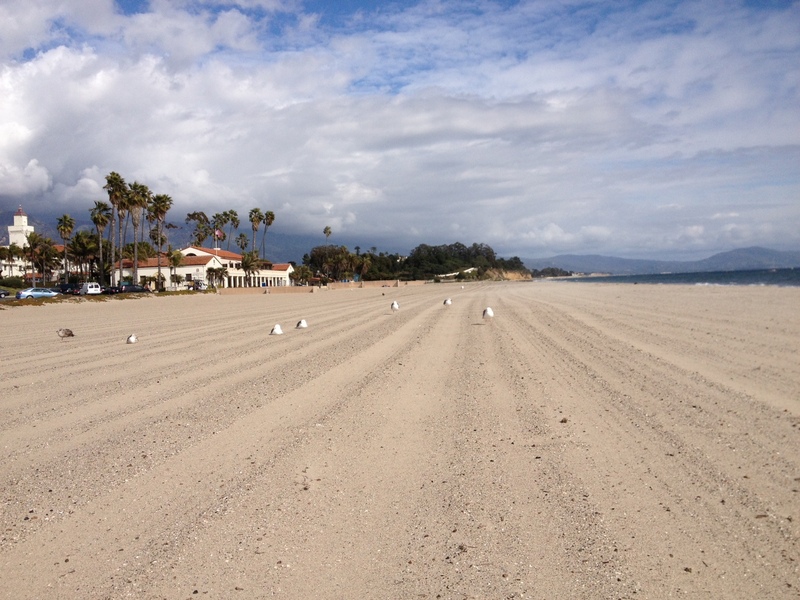 Still, I felt a bit down the next day and didn’t enjoy Santa Barbara as much as I had expected. Even though the sun shone it was cold as the wind picked up a bit. The shops were very nice though, and we stopped at an olive oil shop where the shopkeeper Robert – once he heard we were from Holland – told us he loves Kinder surprise eggs (the chocolate eggs made of milk and white chocolate with the little gifts inside). So I made a promise to send him some. He has a webshop (www.vivaoliva.com) so anyone who loves olive oil can order some here. We passed a wonderful teashop with beautiful japanese teapots and teacups. I wouldn’t mind buying some, but the prospect of trying to stuff them in my suitcase stopped me. So I bought some loose leaf herbal tea called Tranquil Dreams and filter bags. We stopped by the beach and took some pictures of the seagulls and waves and then headed south down the 101.
all very interesting and your camera works well! !